Managing information is the key factor today for running a good business. Migration companies have now identified the need to simplify their company and its workflow process. Simplifying the flow of work means making it more efficient, effective and fast. Generally, agency workflow process of migration companies defines how they carry out a given task. It marks each step of what to do and who to involve. For instance, migration companies might have workflow processes for handling client applications, receiving and submitting invoices or connecting with new clients and prospects. When everyone on the team follows a well-tested process, there are fewer errors, delays, and duplications in the work they perform. The pitfall of bad processes can be severe for migration companies – increased client complaints about the services, rising costs, frustrated co-workers, wasted effort, and resources, to name just a few. Migration companies need to consider the individual task, along with its intended SMART agency goals. What is the goal of that particular task? What steps are migration companies taking to reach that goal? How frequently do migration companies use this process? Is the process incurring extra costs for migration companies? How does it affect your staff? Are they unhappy with a specific part of the workflow process or the entire workflow process as a whole? How would you resolve this issue? Consult staff members, who use the process regularly and note down their feedback. Step 2: Figure out what sort of business workflow process you need. Choose a process that supports multiple workflow processes, so whether you are an education or migration agency, it works both ways. Oversight and allocation of responsibilities is a significant part of every proper business workflow process. Immigration agents should be able to create groups such as admins, managers, accountants, administrators, counselors, and so on. The admin can then assign a user to each group, to regulate access and control over the type of data shared within the system. The agency team should be able to assign and share tasks with each other. Immigration agents should be able to trace each task through every stage and view comments along the way. At every stage, your team should be able to send emails, add notes, set due dates, post comments, and upload documents. All changes made should retain a history or log, to keep users informed at all times. Receiving and sending invoices is a major part of your business workflow process. Migration companies should be able to create and customize invoices, as per their consultancy needs. Once migration companies have figured the kind of workflow process their consultancy requires, they may need to acquire education and immigration tool, such as Agentcis, hire a new team member or organize a training session. Consult with their business partners and team members. Immigration agents need to communicate clearly with each of them, to ensure they understand how this new process works and benefits the agency. The first thing is to be acquainted with how the software works. Subscribe to a free trial and test it out. Immigration agents need to take help from technical support if required. Do not hesitate to experiment and try out everything it has to offer. Before directly getting the clients involved in the new process, do an in-house role-play to figure its potential and outcomes. Create various possible client scenarios from past agency experience and check if the software can deliver. Agentcis, helps you improve your business workflow process by keeping track of client progress across various stages. Its ability to allocate customizable and multiple workflows to add flexibility to your agency operations. The software helps your immigration consultancy to take control of daily processes and manage them better. Rolling out a new agency workflow process needs proper planning and management. Immigration agents consider running a pilot project since your team will take some time to get used to it. The main thing for immigration agents is to get everyone involved as per their job roles. Directors can generate reports on major variables that provide insights for predicting and planning a course of action for the agency. Managers can work on increasing productivity by preparing strategies to deal with clients as well as mentoring and motivating the staff. Counselors can choose options that match your clients’ interests without wasting much time. Accountants can create, update and retrieve invoices with utmost ease. In just a few seconds, they can locate invoices and take appropriate action. Administrators can directly find out if data and documents are missing since they have access to all users. Marketers can generate reports on popular countries, courses, and important trends. Additionally, they can store this information and plan client marketing strategies accordingly. Step 5: Review the process once again and implement! Every business is unique, and so is yours. Therefore, it is essential for immigration agents to know how you can customize the workflow process for your agency management needs. You should be able to receive all notifications on time and as per your schedule. The team members should be able to work according to their assigned roles and responsibilities. The admin should have access to all users and data. Measure the amount of time it takes to complete a client application – from start to finish. 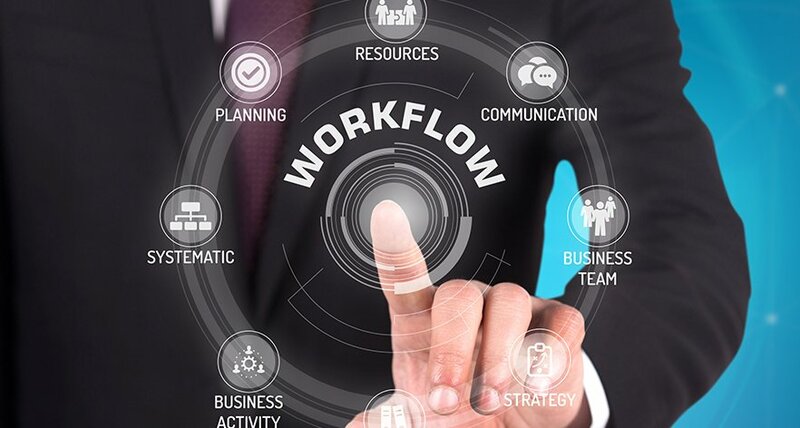 For most people and businesses, changing or improving the workflow process is never easy! Same is valid for immigration agents. However, the key is to make your team understand what the improvements are all about, so they can be comfortable and efficient in their roles. Once they get it, the rest becomes easy!